With Passover around the corner I am seeing lots of recipes for brisket, potatoes and flour-less cakes. With all the heavy food and pressure to come up with impressive meals I thought it would be nice to talk about a simple and light dish. 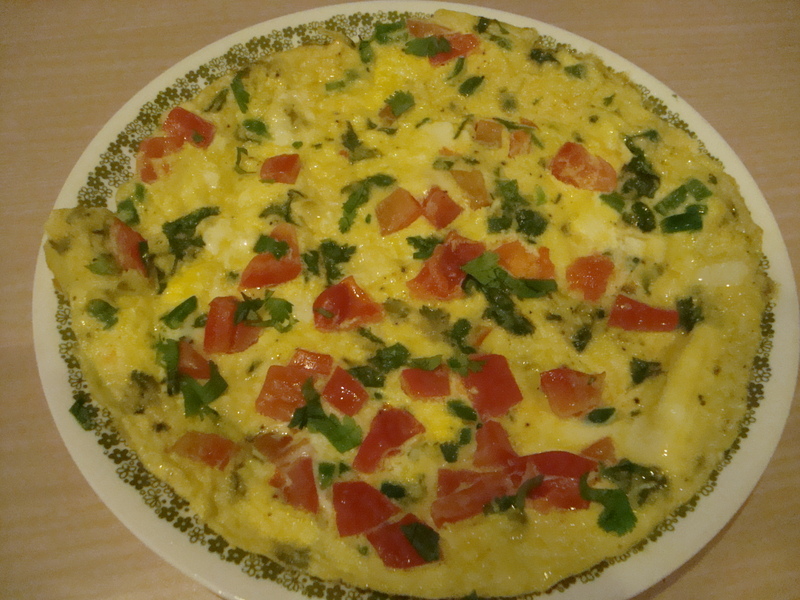 So, I have a recipe that I want to share that is great for Passover or any time of the year, my family’s version of an Indian omelet. I love eggs – sunny side up, sunny side down, scrambled, omelets, frittatas. I love them all! I do not think that eggs are just for breakfast and eat them any meal of the day. In fact, I eat eggs at some point in the day almost every day. They are an inexpensive source of protein and vitamins. I do have a few rules that I try to stick by when making them. I use one whole egg and one egg white per serving to cut down on the cholesterol and fat. I also try to always incorporate some kind of vegetable into the recipe. I literally have dozens of egg creations so stay tuned for many other egg dishes. This omelet is close to my heart as it is the way my dad made eggs for me when I was growing up and still to this day. Whenever my friends would sleep over at my house they would be treated to this omelet the next morning. Maybe that is why I had a lot of sleep overs 🙂 This is the only time that I ever make eggs without sautéing the vegetables first. It is actually a really easy recipe in that you just throw everything into a bowl and then everything into the pan. Although I love when my dad makes this for me, there are a few ways in which I have made this recipe my own. First is that my dad would normally make this with chopped yellow onion. Since the vegetables do not have the chance to cook before adding the eggs, I prefer to use scallions as they have a more mild onion flavor. I also tried to make the recipe more health conscious by using both whole eggs and egg whites and by spraying the pan with oil as opposed to cooking them in a layer of oil. If you do not like spice you can leave out the chile, but I really recommend putting it in and just taking out the seeds and ribs which is where the heat lies in the pepper. If you do like spicy food then leave some or all of the seeds in, just beware! This is also a recipe that you can easily make for one by halving the ingredients or make for a crowd by doubling or tripling them. Crack two whole eggs and two egg whites into a medium bowl. Beat the eggs until the yolks and whites are combined. Add the scallions, chili, cilantro, tomato, salt and pepper. Beat until all the ingredients are mixed. Spray a medium sized frying pan with olive oil and place over medium heat. Once the pan is hot, pour in the eggs and vegetables and stir with a flexible spatula so that all the vegetables are distributed across the pan. Lower the heat to medium-low. Continue to pull the egg away from the sides of pan as they set. Once the bottom of the eggs are set and the eggs pull away from the side of the pan, place the spatula under the eggs and flip the omelet. If it seems like the omelet is not going to flip then place the pan under the broiler cook and the eggs until the top is firm (2-3 minutes at the most). If your pan has a plastic handle leave the handle sticking outside of the oven and only place the pan under the broiler. 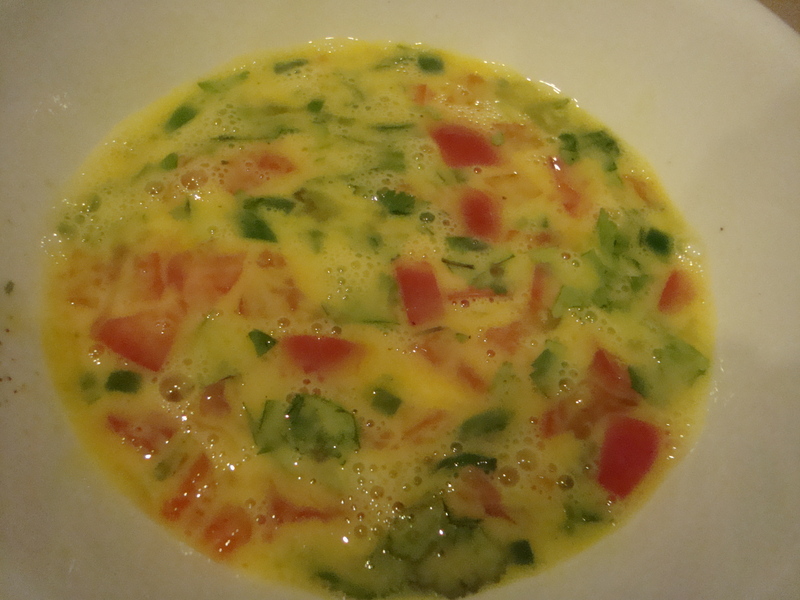 Turn the omelet onto a plate. Enjoy! yum! so good on matzah too… my mom never put tomatoes in ours but it’s something that i added to my version. love it! thank you! Cilantro adds so much flavor! I still look forward to these omelets every time we are at home! with potatoes,chopped in small cubes, onion, a pinch of saffron powder, fresh chillies, tomatoes, sauté followed by eggs and finally garnished with fresh chopped coriander. This is a favourite among us Indian Jews and known as Mahmoosa. Did your dad make this for you. He was brilliant at cooking when we were growing up. I made the omelet for dinner this p.m. Followed exactly. Enjoyed it with a salad. I think I will have this as a Sunday dinner on a regular basis unless I tire of it. It is so easy to make. Thanks.